Although I could go farther back in time, I felt it was wise to start AD 711Moors (a medieval Muslim-African tribe) conquered the Visigoths (an Eastern Germanic tribe) at the battle of Guadalete and begin elaborating wine despite being strictly forbidden by the Koran. The religious justification was that the production of raisins and the distilling of alcohol for medical purposes (when even the Moors drank Sherry) were pretexts for maintaining vine cultivation and wine production. The region eventually became famous for their wines, and was called Seris, pronounced Sherish, and later bastardized into Jerez by the Spanish and Sherry by the English. But like all religions, there is always a handful of people who fear the consequences of not abiding by the strict word of their religious text, and in 966 Caliph Al-Haken II ordered the up-rooting of all vineyards in Jerez on religious grounds. However, Al-Mansur, his vizier, was a wine connoisseur (a man after my own heart) and when called upon by his people to save their grapes in order to produce raisins to feed the troops in their Holy War, which was partly true, Al-Haken responded by allowing only one third of the vineyards to be destroyed. Is it just me, or does the heroic fight to save raisins for your troops seem a little hard to swallow when considering how many people can actually live on the consumption of grapes? Larger vegetables and fruit, sure, but raisins? If I’m fighting a war, holy or otherwise, I would hope my king would be wise enough to send me a jug of sherry, justifying it as medicinal if he chooses, before giving me a handful of little dry fruit! And then there was King Alphonse X (also known as King Alfonso or Alfonso “The Wise”), who in 1264 reconquered Jerez under the guise of Christianity. And although I am not the biggest advocate of Holy Wars, I will grant our dear King Alfonso the additional title of “the wise” as a reward for his decision to protect the sherry region by demarcating the Kingdom of Castile around its borders. King Juan I later added the suffix, “de la Frontera” to Jerez for both its good service, and for being the unfortunate border town between the rivaling Muslim and Christian Kingdoms. Now here is where you look back upon your World History class and think to yourself, why wasn’t I ever told about this? Evidently, Magellen, our world renowned Portuguese explorer, spent more money on Sherry than on weapons, making it the first wine to make a complete trip around the world. Granted, he may not have been the most practical of men, but as far as world explorers, I’ll give him points for style. In 1530, William Ostrych of Bristol, England, received a grant from King Henry VIII to charter a church called St. George in Sanlucar de Barameida, in exchange for Sherry. As a result, by the time Elizabeth I came to power, sherry sack was considered her preferred drink. ‘Sack’ originating from the Spanish word ‘sacar’ meaning to export or take out. We look further into this word, “to sack” also refers to being robbed, or to take stolen goods out of your sack, as exemplified by Sir Francis Drake. 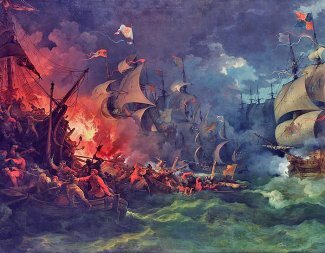 1587 Sir Francis Drake set fire to the Spanish fleet in the Bay of Cadiz and promptly robbed the Spanish of approximately 2,900 casks of wine, capturing six ships and destroying 31 others as well as a large quantity of goods. The attack delayed the Spanish invasion by a full year. Now whether the number of casks is actually accurate or not, Julian, and I tend to agree, states that this little stunt most likely put Sherry on the map as more than bourgeois drink, but a drink for British masses. William Shakespeare and his friend Ben Johnson at the Bear’s Head Tavern used to go through several bottles of Sherry a day, potentially influencing his character Falstaff in a Midsummer’s Night Dream to proclaim: “If I had a thousand sons, the first humane principle I would teach them should be, to forswear thin potations and to addict themselves to sack”. In the late 1700’s like the California gold rush where Americans flew to California in hopes of land and riches, wine merchants from Scotland, Ireland, France and England flocked to Cadiz in hopes of planting vines and exporting sherry. 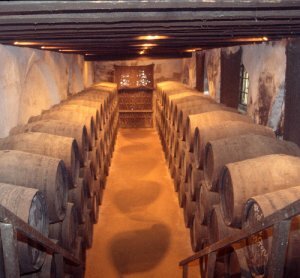 Many of these bodegas are still in existence today, and considered some of the premier sherry houses in Jerez such as: Fitz-Gerald, O’Neal, Garvey, MacKenzie, Wisdom, Warter, Williams and Sandeman. Unfortunately, Sherry Wines had their downturn as well, when in 1890 sales declined rapidly as a result of poor quality, Phylloxera– resulting in many bodegas going bankrupt before replanting was achieved in the 20th century, and a general trend towards lighter wines that didn’t need to be consumed with food, as Sherry tended to be. With a little advertising proted by the Sherry Shipper’s Association, alongside swinging sherry cocktail parties hosted by Carl Williams, the popularity among Brits to drink the perfect apertif was once again on a rise. On a rise that is until the 1941 when WWII brought considerable hardship on Sherry exports, dropping production exponentially. Fortunately, the Sherry loving Dutch revived these Andalusian wines in 1960, and has remained the second largest consumer of Sherry behind England. Today, it is theorized that the solera system was born from Bodegas continually storing wines from several different harvests, in addition to continually supplying the market with a high quality wine. Currently, there are 3,703 vineyards in DO Jerez covering over 10,359 hectares by 2,281 owners (the number of owners includes cooperatives, individual growers and bodegas). Sixty percent of all production comes from Jerez de la Frontera, followed by Sanlucar de Barrameda at 15%. I have yet to actually see the South of Spain, taking my husband’s word that the beauty is breathtaking, and that art of sherry winemaking is a sight to behold. I trust I too will experience the smell and touch of the old casks, wondering what could have possibly been happening in Spain for each and every harvest. If you consider that it is possible to drink the land and the memories of the vineyards, I can’t imagine a more profound drink than Sherry.